Hitler's own generals tried to assassinate him on July 20, 1944, to end Nazi Germany's all-out commitment to a war that was now clearly lost. But the assassination attempt failed. 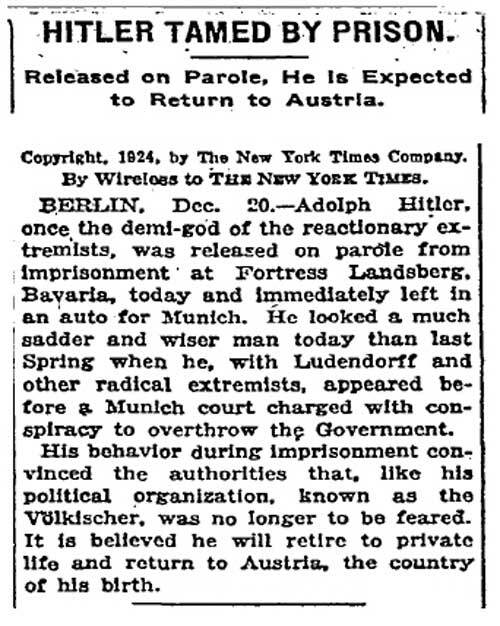 Hitler took revenge by purging the General Staff of anyone deemed suspicious or exhibiting defeatist behavior. Nearly 200 officers and others were killed, in some cases, slowly hanged from meat hooks. Germany under Hitler would now fight-on to the very last, utilizing every available human and material resource. In September, Hitler Youth Leader Artur Axmann proclaimed: "As the sixth year of war begins, Adolf Hitler's youth stands prepared to fight resolutely and with dedication for the freedom of their lives and their future. We say to them: You must decide whether you want to be the last of an unworthy race despised by future generations, or whether you want to be part of a new time, marvelous beyond all imagination." With the Waffen-SS and regular army now depleted of men, Hitler ordered Hitler Youth boys as young as fifteen to be trained as replacements and sent to the Russian Front. 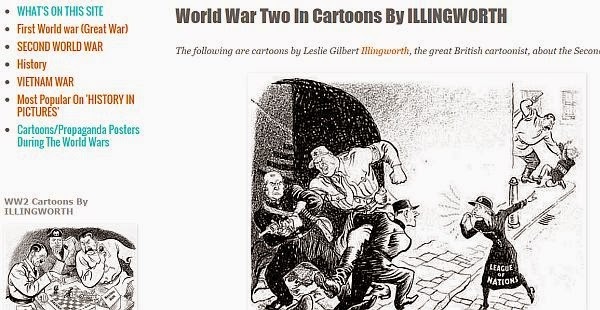 Everyone, both young and old, would be thrown into the final fight to stop the onslaught of "Bolshevik hordes" from the East and "Anglo-American gangsters" from the West. On September 25, 1944, anticipating the invasion of the German Fatherland, the Volkssturm (People's Army) was formed under the overall command of Heinrich Himmler. 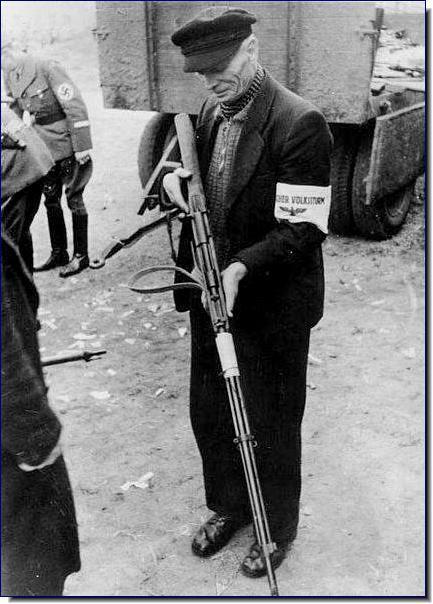 Every available male aged 16 to 60 was conscripted into this new army and trained to use the Panzerfaust anti-tank weapon. Objections to using even younger boys were ignored. In the Ruhr area of Germany, HJ boys practiced guerilla warfare against invading U.S. troops. In the forests, the boys stayed hidden until the tanks had passed, waiting for the foot soldiers. They would then spring up, shoot at them and throw grenades, inflicting heavy causalities, then dash away and disappear back into the forest. The Americans retaliated with furious air-attacks and leveled several villages in the surrounding area. If the boys happened to get cornered by American patrols, they often battled until the last boy was killed rather than surrender. And the boys kept getting younger. American troops reported capturing armed 8-year-olds at Aachen in Western Germany and knocking out artillery units operated entirely by boys aged twelve and under. Girls were also used now, operating the 88mm anti-aircraft guns alongside the boys. In February 1945, project Werewolf began, training German children as spies and saboteurs, intending to send them behind Allied lines with explosives and arsenic. But the project came to nothing as most of these would-be saboteurs were quickly captured or killed by the Allies as they advanced into the Reich. 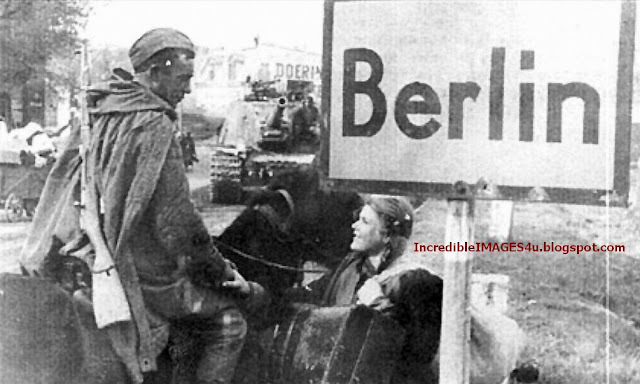 The Russians by now were roaring toward Berlin, capitol of Nazi Germany, where Hitler had chosen to make his last stand. On April 23rd, battalions made up entirely of Hitler Youths were formed to hold the Pichelsdorf bridges by the Havel River. These bridges in Berlin were supposed to be used by General Wenck's relief army coming from the south. That army, unknown to the boys, had already been destroyed and now existed on paper only. It was one of several phantom armies being commanded by Hitler to save encircled Berlin. At the Pichelsdorf bridges, 5,000 boys, wearing man-sized uniforms several sizes too big and helmets that flopped around on their heads, stood by with rifles and Panzerfausts, ready to oppose the Russian Army. Within five days of battle, 4,500 had been killed or wounded. In other parts of Berlin, HJ boys met similar fates. Many committed suicide rather than be taken alive by the Russians. All over the city, every able-bodied male was pressed into the desperate final struggle. Anyone fleeing or refusing to go to the front lines was shot or hanged on the spot by SS executioners roaming the streets hunting for deserters. In his last public appearance, just ten days before his death, Adolf Hitler ventured out of his Berlin bunker on his 56th birthday into the Chancellery garden to decorate twelve-year-old Hitler Youths with Iron Crosses for their heroism in the defense of Berlin. The extraordinary event was captured on film and remains one of the most enduring images chronicling the collapse of Hitler's thousand-year Reich, as the tottering, senile-looking Führer is seen congratulating little boys staring at him with worshipful admiration. They were then sent back out into the streets to continue the hopeless fight. 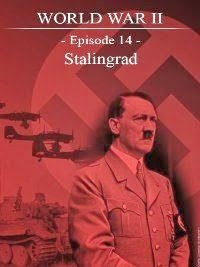 On April 30, 1945, as the Russians advanced to within a few hundred yards of his bunker, Hitler committed suicide. The next day, Hitler Youth Leader Artur Axmann, who had been commanding an HJ battalion in Berlin, abandoned his boys and fled to the Alps. In Vienna, Baldur von Schirach abandoned HJ units fighting to defend that city. Hitler Youth boys, along with old men, were hastily trained, ill-equipped and not terribly well led were the major recruits for the Volkssturm in the closing months of the year. The HJ boys, however, went into battle with a fervor even beyond that of the Waffen SS. 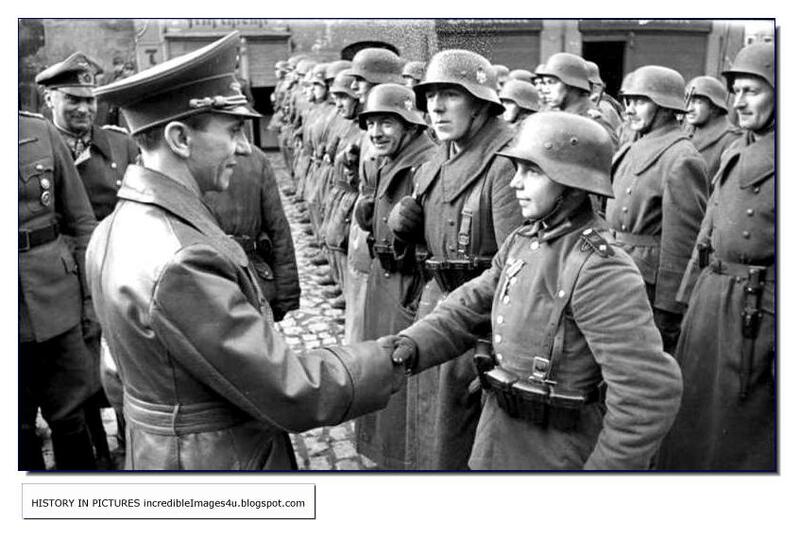 Many accounts exist of battle hardeneded Wehrmacht and and SS troops who met these boy soldiers on the way to battle. Their advise was almost often "Its over. Go home!" The boys, however, armed with a few anti-tank weapons like Panzerfauts and perhaps a machinegun if one could be found, these Hitler Youth schoolboys went into battle. Often they performed amazingly well, even when given hopeless assignments. A book and movie addressing this is The Bridge. Many HJ boys, of course, did not survive. For many, their commiment to Hitler was absolute, even in the boys involved in the hopeless defense of Berlin (April-May 1945). The enemy has taken action to crush our empire to destroy the German people and their social order, her ultimate goal is the extermination of the German race. Once again, our strong will, the continuity of the Empire and therefore of Europe will be assured. But our enemies believe they can give the final blow, we have decided to again use the power of our people. [...] The intentions of our enemy, international Jewry, of annihilation, will be destroyed by the will of the German people. 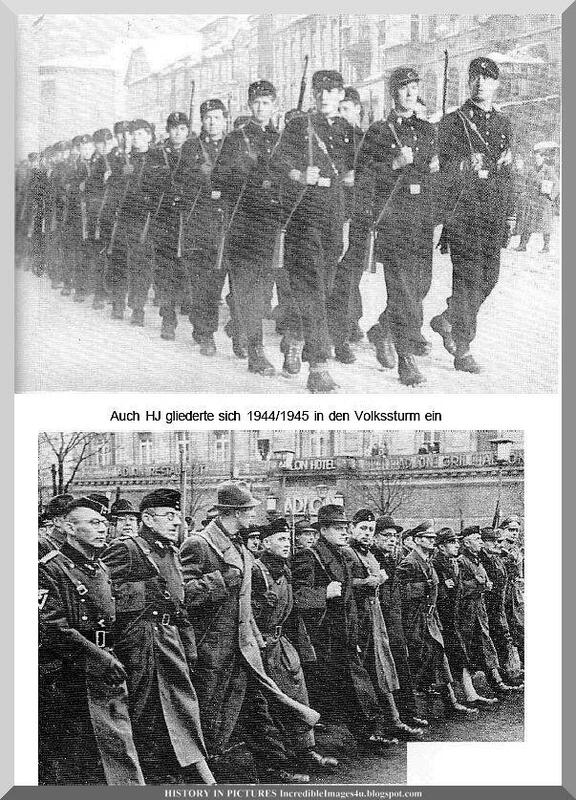 1) form the Volkssturms, defense forces of the German people, in all districts of the Greater German Empire, in which all men must serve 16 to 60 who are able to carry a gun. Defend the homeland with all the weapons and the means at its disposal that seem appropriate. 9) The National Socialist Party is fulfilling its obligation highest honor to the German people, to give priority in their organization to fulfill its responsibility in this fight. The Allies in July 1944 smashed the Wehrmacht on the Western Front in an Allied offensive culminating in huge losses at Falange. The remaining units retreated from France and Paris was liberated in August. 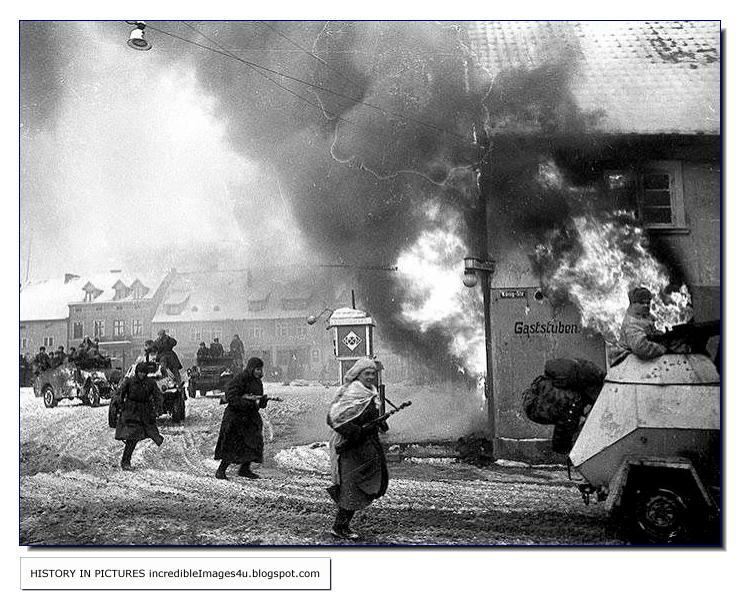 The Russians took Warsaw and Budapest and were poised on the borders of the Reich. As a last ditch effort to stave off defeat in October 1944, all males aged 16 to 60 were required to join the Volkssturm, or Home Guard. The Wehrmacht now disgraced in Hitler's eyes. Thus command of the Volkssturm was given to Reichsführer-SS Heinrich Himmler. 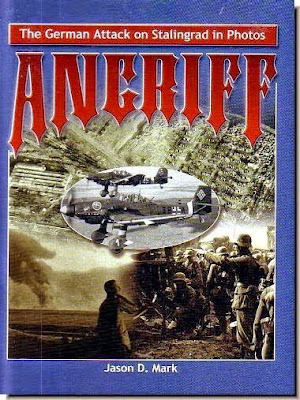 (Himmler by this time had ammassed many other titles in the shrinking Reich such as Chief of the German Police, Minister of the Interior, Chief of Army Armaments, and oversaw many other programs such as intelligence, concentration camp labor, V rocket produtction, Consolidation of German Nationhood (RKF) Voldsdeutsche Mittelstelle RuSHA, and Dienstelle Heissmeyer.) [Padfield, p. 537.] Himmler announced the plan for the Volkssturm to the German people on October 18 over Grossdeurschen radio. 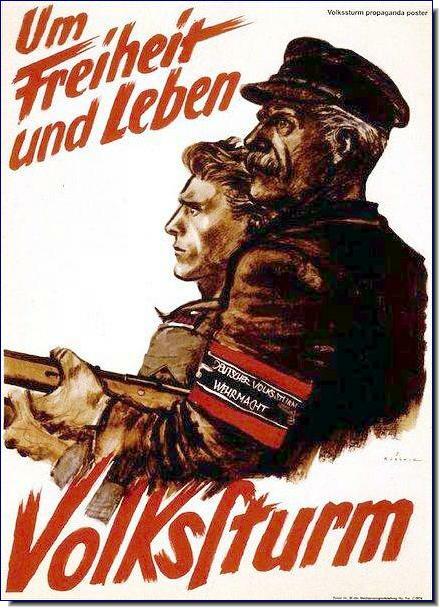 Volkssturm meant "People's Storm". A stidio audiance sang "Volk ans Gewehr!" (people to arms!). Himler recalled the Landwehr and Landstrum which had defeated Napoleonic armies and liberated Germany in 1813. He mentioned resisistence like werewoves in areas of the Reich that the Allies had occupied. Volkssturm units were to be raised in each Gau of the Reich by the NAZI Party Gauleiter. 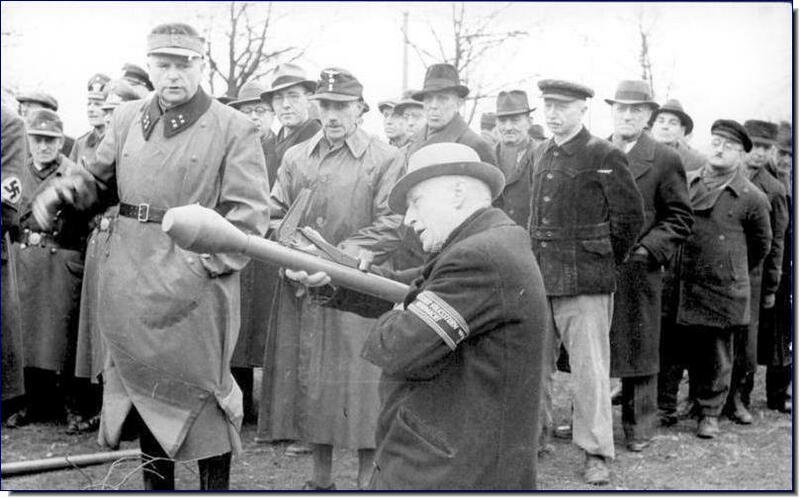 East Prussian Gauleiter Ericfh Koch had already raused a local Volkssturm as he was the firsrt Gauleiter faced with the Red Army. 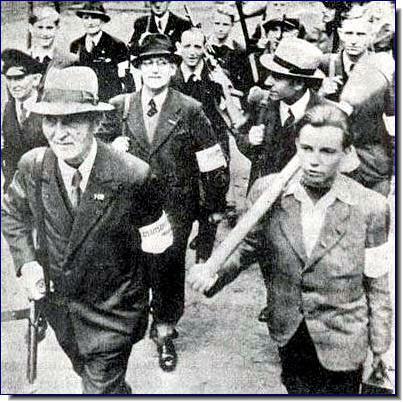 Hitler Youth boys, along with old men, were the major recruits for the Volkssturm in the closing months of the year. As a last ditch measure to save the Third Reich, they were inducted into the Volkssturm. Boys as young as 16 were required to join the Volkssturm, but younger boys were accepted as volunteers. Older men up to age 60 were also inducted. Most men were already on active service. 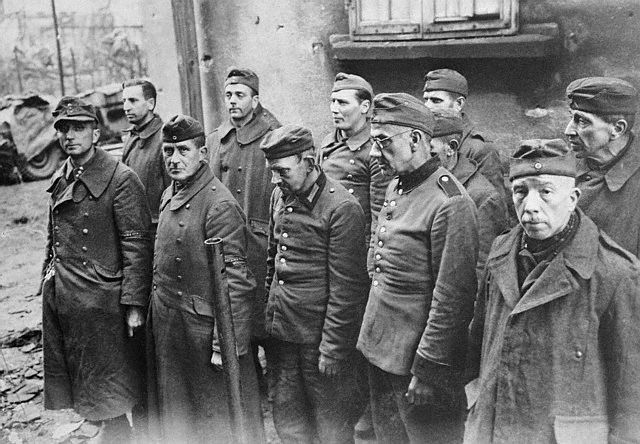 The recruits Volkssturm recruits were mostly boys or men old enough to have been veterans of World War I. The Hitler Youth members were the backbone of the Volkssturm since they had been received some military traing. They were also often more willing to fight than the older men. Part 1: "First, we swear thatm like our fathers, we want to be loyal, loyal to the Führer, whom the Lord God has sent to us, loyal to the Reich which unites att German stems for centuries and that is and will be as it was formerly the regulating power of the European continent. Loyal to the Volk and thereby to ourselves, because we are the most valiable elements to defend and preserve the eternal like of the German peoples, its women and children, and therewith its blood that vhas created so much that is noble for man." Part 3: To know that the most poweful forces a people could muster were believing hearts and steadfastness. Part 4: "We have learned from the very mouths of our enemies what we can expect, the destruction of our country, the clearance of our woods, the dissolution of our economy, the annihilation of our towns, the burning down of our villages, and the extermination of our peoples .... Never and nowhere are Volkssturm men [HBC note: Of course many were boys.] permitted to capitulate. If at ant time aesponsible leader believes himself to be in a hopeless position where he must give up the struggle, the usual custom of our brave Navy is valid for the Volkssturm: he must give up the command to that subordinate--even if he be the youngesr--who has the will to continue the fight." The Volkssturm was hastily trained and sometimes not at all. Reichsjugendführer Axmann stated in a memorandum that, "from the Hitler Youth has emerged a movement of young tank busters. There is only victory or annihilation." The Volkssturm was ill-equipped. 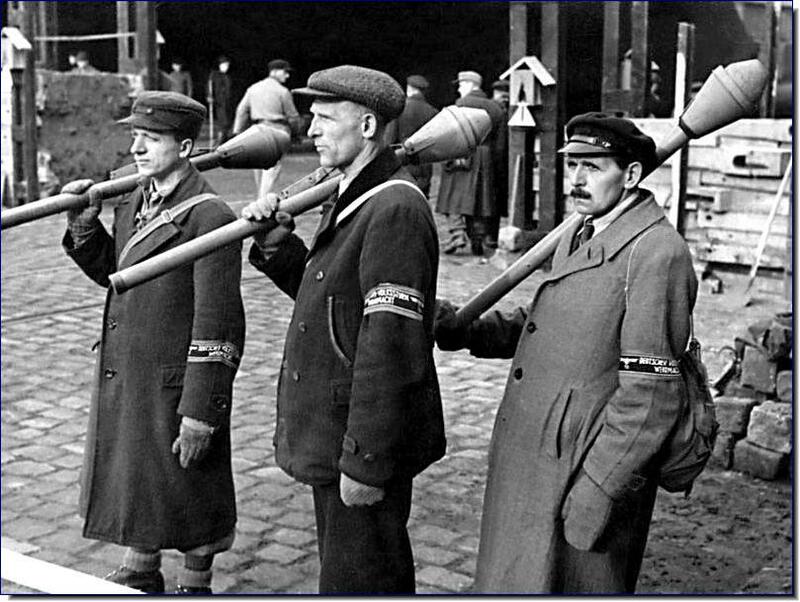 The most effective weapon given to the Volkssturm was the Panzerfaust, a type of light-weight anti-tank weapon. It was simple but effective. Even an 11 or 12-year old boy could fire it and disable a tank. Quite a few did just that. There was no actual Volkssturm uniform. Some members wore various items of the Wheremacht uniform that may have been available. So some may have looked esentially like Wehrmacht soldiers. Many boys wore their Hitler Youth uniforms if Wehrmacht uniforms stocks were exhausted. While a youth group, it was a uniform and would have been considered preferable to civilian clothes. 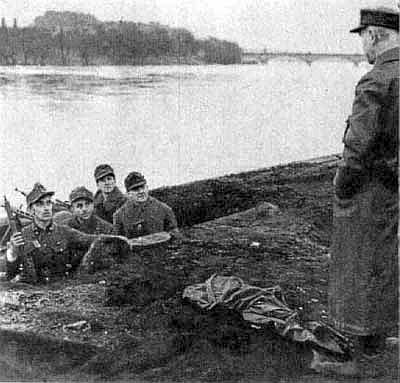 The Volkssturm members were given black-red armbands which read "Deutsche Wehrmacht". 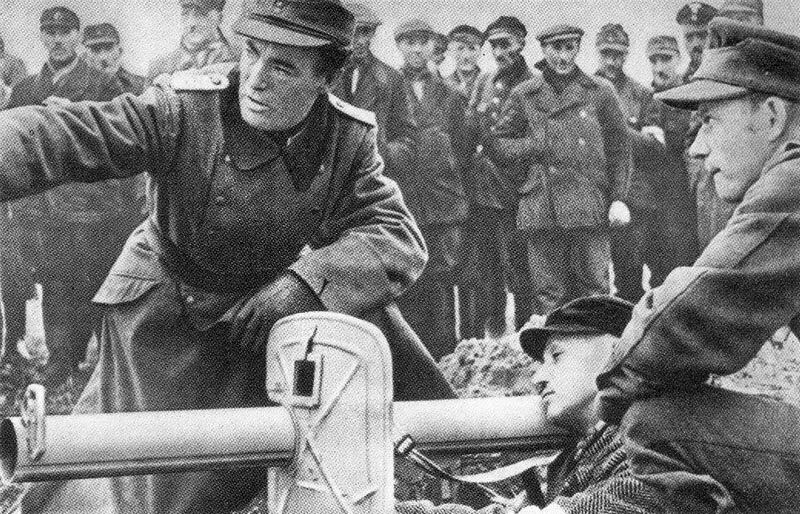 The Volkssturm was poorly led often by inexperienced officers. 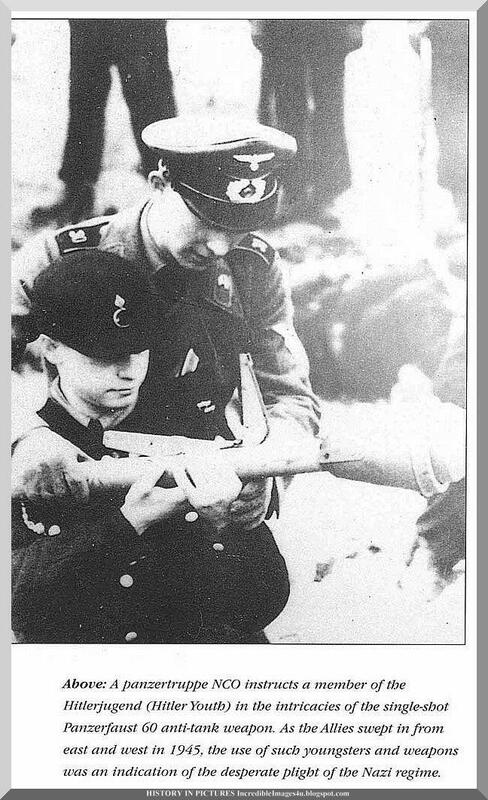 Often Hitler Youth youth officers were put in charge. One boy who was 17 years old, described his unit, "I stood in front of a platoon of the Volkssturm. Of the 45 men, only 10 were Hitler Youth members; the others were in their 40s and 50s. Herr Wolff, whose son had fallen as a sergeant in the Waffen-SS, was 65. 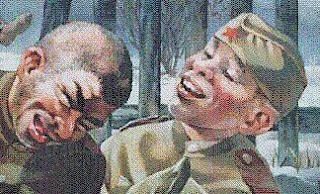 I eyed them with some apprehension: undisciplined, over-aged, unfit civilians wearing black-red armbands with the inscription Deutsche Wehrmacht. I felt very self-conscious as their leader. Some were the fathers of my schoolfriends." The HJ boys went into battle with a fervor even beyond that of the Waffen SS. 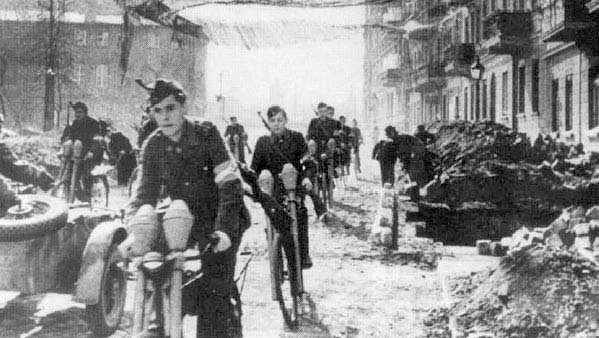 Many accounts exist of battle hardeneded Wehrmacht and and SS troops who met these boy soldiers on the way to battle. Their advise was almost often "Its over. Go home!" The boys, however, armed with a few anti-tank weapons like Panzerfauts and perhaps a machinegun if one could be found, these Hitler Youth schoolboys went into battle. Many looked on the retreating Wheremacht soldiers with disdain. Often they performed amazingly well, even when given hopeless assignments. A book and movie addressing this is The Bridge. Many HJ boys, of course, did not survive. For many, their commiment to Hitler was absolute, even in the boys involved in the hopeless defense of Berlin (April-May 1945). Volkssturm units formed from the Hitler Youth would attempt to ambush advancing Allied infantry patrols. Not infrequently if the boys were cut off, the boys would fight to the last and refuse to surender. American and British units report encountering units with children as young as 12 years old. The Russians must have had the same experience. 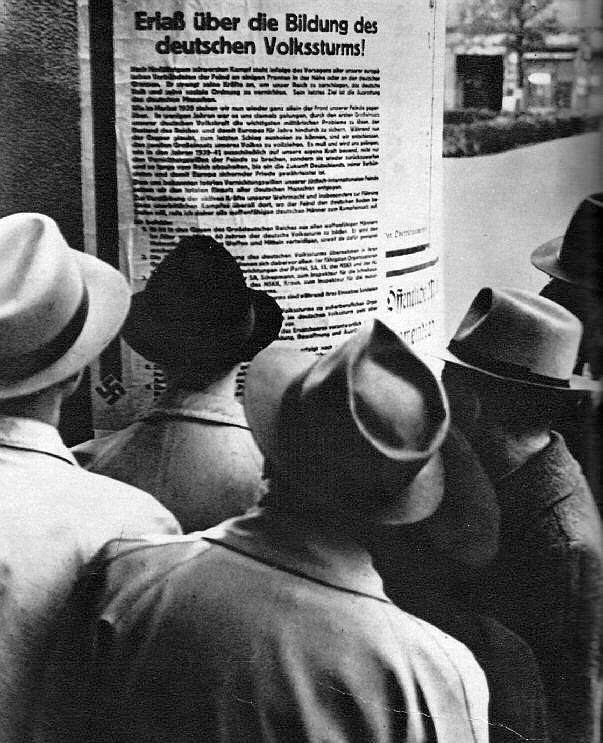 One of the Volkssturm's most noted engagements took place in Berlin during the Russian onslaught in April 1945. There were 5,000 Hitler Youth boys ordered to defend the Havel River bridge. Their orders were to hold a bridgehead until Wenck's army arrived to save the city. There was in reality, however, no relief on the way. The Wheremacht by April was largely defeated and except for SS units, there major interest was to move west to surrender to the Americans or British rather than move east to engage the Russians. Wenck's relief army existed only in Hitler's mind. After 5 days of fighting, the original 5,000 boys had been reduced to only 500 boys who were still on their feet. These children and many others were sacrificed to provide Hitler afew more days in his bunker. Holztrager, Hans. In a Raging Inferno, 2001. Koch, H. W. The Hitler Youth (New York: Stein and Day, 1975). ____________. "Young People: For or Against the Nazis?" 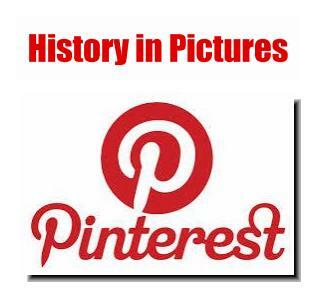 History Today Vol. 35, October, 1985, pp. 15-21. Peukert, D. J. K. Inside Nazi Germany (New Haven: Yale University Press, 1987). Rempel, G. Hitler's Children: The Hitler Youth and the SS (Chapel Hill: University of North Carolina Press, 1975). Please, could anyone from this interesting site on ww2 and the Hitler youth, help in finding the real name of one of the last remaining war veteran, of which I have a clear photo of him, as he was captured in Wezlar by the American Allies, on the 29th March 1945. If still alive, he should be around 84yrs, most probably the same age as Hans George Henke, and Willi Huebner. I would be so grateful for any help given. If you wish, I will send to you, the soldier's photo. Thanks for your co operation.